Shipping fine sourdough breads, focaccia, and cookies to all lower 48 states. To order, please cal 870 447-2211, or email us with a subject line of NEW ORDER at support@serenityfarmbread.com. We do not ship pastries, but you may order some for pick-up if you are traveling through. COUNTRY FRENCH HEARTH 24 oz. Unbleached unbromated artisan white flour with about 15% whole wheat flour, filtered water and unrefined sea salt. COUNTRY FRENCH MICHES 4.4 lbs. Large diameter rounds. 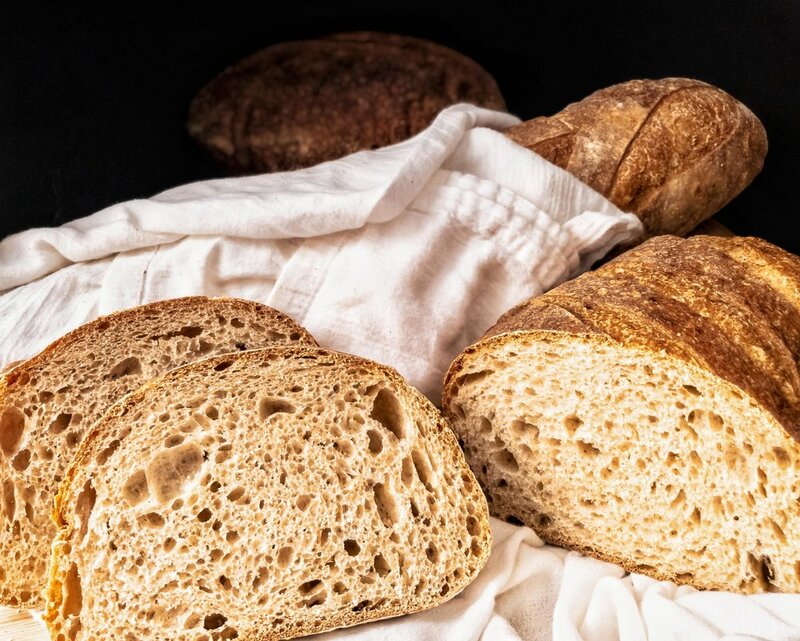 Larger loaves produce superior texture and crust. Slices make great sandwiches. COUNTRY FRENCH BAGUETTES 24 oz. Same dough as above, but in long French bread form. More crust! COUNTRY FRENCH BATARDS 24 oz. Just like the baguettes, except shorter and fatter. Better for sandwich slices. 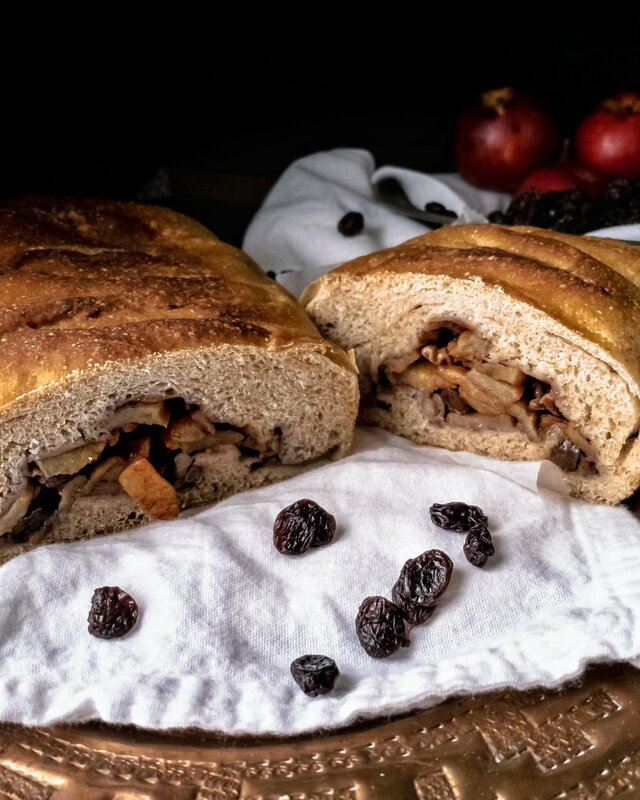 Our Country French dough with toasted pecans and dried, apple juice sweetened cranberries added. *NEW* This delightful new bread is a 50/50 mix of Organic Whole Wheat and Unbromated White Flour with Raw Sunflower Seeds and Locally-Sourced Honey, giving it the slightest hint of sweet. A blend of organic unbleached white flour, organic whole wheat flour, organic spelt flour, organic rye flour, organic rolled oats, filtered water, flax seeds, sesame seeds, and unrefined sea salt. WHOLE WHEAT BREAD 24 oz. Organic whole wheat flour, filtered water, organic unbleached white flour (in leaven only), and unrefined sea salt. The simplest, most basic bread. Ask about availability. 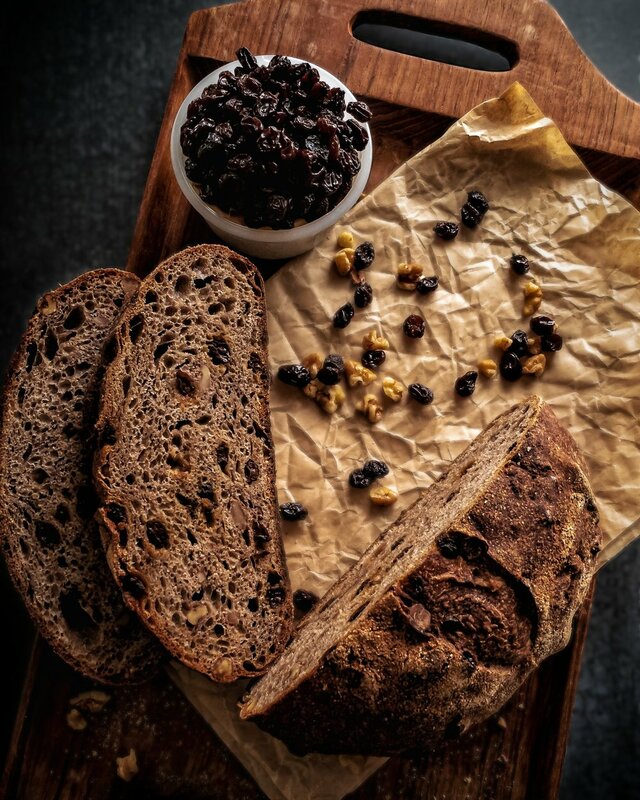 WALNUT RAISIN BREAD 20 oz. Organic unbleached white flour, organic whole wheat flour, organic raisins, walnuts, filtered water, and unrefined sea salt. Approx. 40% whole wheat. EUROPEAN-STYLE RYE BREAD 24 oz. Organic whole rye flour, organic unbleached white flour, filtered water, unrefined sea salt, and caraway seeds. WHOLE SPELT BREAD 24 oz. Organic whole spelt flour, filtered water, organic unbleached white flour (in leaven only), and unrefined sea salt. People who are somewhat sensitive to wheat may find that spelt agrees with them better. This bread has a delicious taste. Fresh bananas, organic whole wheat pastry flour, pecans, dates, maple syrup, filtered water, canola oil, organic unbleached white flour, organic lemon juice, vanilla extract, unrefined sea salt, and baking soda (only a tiny bit of soda is added to augment the sourdough leavening). Made with County French dough. No oil added. A beautiful braided loaf filled with apples, walnuts, organic raisins, a little honey, cinnamon, ginger, and nutmeg. Country French dough brushed with olive oil, fresh chopped garlic, and sprinkled with mixed herbs and our wonderful unrefined sea salt. 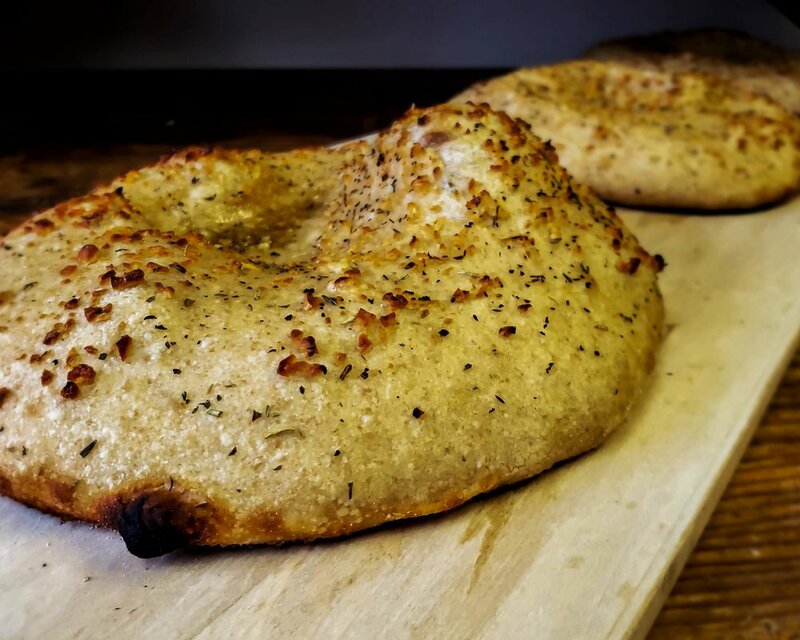 Whole wheat dough brushed with olive oil, fresh chopped garlic, and sprinkled with mixed herbs and our wonderful unrefined sea salt. Spelt dough brushed with olive oil, fresh chopped garlic, and sprinkled with mixed herbs and our wonderful unrefined sea salt. Country French dough brushed with olive oil and fresh chopped garlic, organic fat-free marinara sauce, herbs, and dotted with Greek Kalamata olives. Buy 9 regular loaves, get 1 free. Sliced bread add .25/loaf. SHIPPING: To preserve the freshness of the product, we ship UPS Ground Service to zones 2, 3, and 4 (roughly a 500 mile radius from Leslie (or Little Rock). We prefer Priority Mail to all other areas in the lower 48 states. TERMS: Customer pays above prices plus shipping charges. Arkansas residents add 9% sales tax. We will send invoice with shipment and expect payment upon receipt. Call (870) 447-2211 by Friday for shipment the following Monday or Tuesday. Discounts are available for retailers, restaurants, etc. Email support@serenityfarmbread.com for wholesale rates and policies.